There’s no easier way to instantly change your look than with colored hair extensions (oh and, yes we're using the American spelling of the word and the British spelling...why?...why not?). Whether you want to use clip in coloured hair extensions or you’d prefer to keep it to hair weaves and pre-tipped hair extensions, we’ve got the low down on what suits who and how to choose. If you want a subtle look, stick to colours nearer your own shade of hair. If you have black or brown hair, deep reds and auburns work well; if you have blonde hair, honeys and caramels are great. If you want an edgy look then choose colours like pink or blue hair extensions. After all, you can always take out your hair weave or clip-in coloured hair extension if you don’t like them! Which Shampoos Should Be Used On Colored Hair Extensions? If the hair extensions are synthetic then a regulary synthetic wig shampoo is fine. If you have human hair extensions then a shampoo designed for coloured hair is good and better still if it doesn't contain Sodium Lauryl Sulphate or Sodium Laureth Sulphate - these ingredients can be harsh for human hair as seen in this article about SLS and SLES (at http://www.odylique.co.uk/natural-organic-hair-products/expert-advice/seven-reasons-to-choose-sulphate-free-shampoo.html). These types of shampoos are great for removing stubborn residues from hair like silicones, waxes, hair oils and serums and even shampoo and conditioner residues. Their super cleaning abilities are due to the fact they contain more cleaning agents (surfactants) than ordinary shampoos which is all well and good... until they're used on coloured hair (growth hair or hair extensions) as they can cause the colour to fade more quickly. Clarifying shampoos can be used on coloured hair extensions, but it's best to use them infrequently. Do Colored Hair Extensions Cost More? Uniquely coloured synthetic hair extensions (whatever the attachment method) tend to be the same price as regular colour hair extensions. Uniquely coloured human hair extensions typically cost more than browns, blacks and dark blonde coloured hair extensions. This is in part due to the fact that coloured hair extensions cost more to manufacture but also because of what we'll term as market forces. Choose colours that complement your skin tone and there's a hair colour and skin tone guide to help. If you're darker in complexion and want to go blonde then mix darker blondes (honey and caramel) as highlights with warm browns. If you're pale in complexion and want to go jet black, mix lowlights of dark browns or warm auburns instead of a single solid dark colour. Human hair extensions require maintenance; so much so that we've put together micro ring care guides, hair weave care guides, and clip in hair extension care guides as well as advice for washing braided hair extensions. Synthetic hair extensions need to be washed and groomed. Braided, clamped and bonded hair extensions now come in heat resistant versions (toyokalon, futura or kanekalon) so you can curl and straighten as much as you like. 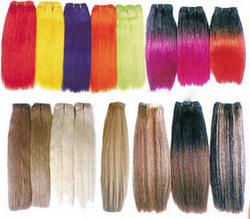 It's also more affordable to choose synthetic hair for bright (fancy) colours. for now, it's a wrap. If you have weave hair extensions then you can find out how to care for them in the Caring for Weave Hair Guide; or to have a sneak peak at what others are asking, peruse the Hair Extensions Q&A section; and to keep up to date with the next guide about hair weave, hair extensions, wigs and hairpieces then join our blog – no personalinfo required.